Polytetrafluoroethylene, or PTFE, is a synthetic compound discovered in 1938. Mr. Roy Plunkett, while working for Kinetic Chemicals, stumbled upon this compound while trying to create a new refrigerant product. A small mishap resulting in a substance forming inside of test container produced a surface that was both waxy and slippery. Seven years later, the product was registered under its current trademarked name, Teflon. Initially, the new invention was used in industry for such things as coating seals and valves on pipes. A French engineer named Marc Gregoire used the coating in the form most of us know it today, as a pan coating. The coating was introduced to frying pans in the United States in 1961 when Marion Trozzolo applied it to a frying pan and dubbed it, "The Happy Pan." While most people recognize this substance in their household pans, it is also widely used in industry. Anytime equipment generates significant friction, Teflon is often applied to reduce the friction levels. One of the biggest examples of Teflon being put to use is the Hubert H. Humphrey Metrodome. The presence of this material is actually what creates the very unique appearance of the white domed roof. In addition to the above uses, Teflon is also used prominently in cabling solutions. In this case, the Teflon coating serves as an insulator as it is resistant to flames and other dangers present in cable lines. 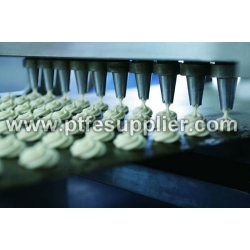 The pharmaceutical industry also makes significant use of the product, as it is ideal to protect processing equipment. Since it is resistant to most chemicals and solvents, any components used in the manufacturing of pharmaceuticals will have no effect on the equipment. Another product that Teflon is widely used is in the production of semiconductors. Its natural properties enable it to resist conditions that would normally erode or damage semiconductors. The fact that it is non-reactive to just about any chemical makes it the perfect insulation for a piece of equipment that sees such extreme conditions. Teflon, or PTFE, like PTFE Adhesive Tape is obviously a mistake that everyone is happy was made. As often happens in research, mistakes make for some of the greatest discoveries. While most people are aware of the household uses for Teflon, some of the industrial uses usually come as quite a surprise. Who would have thought that the safe substance that creates a non-stick surface on our cooking utensils is also protecting semi conductors and cabling from damage?